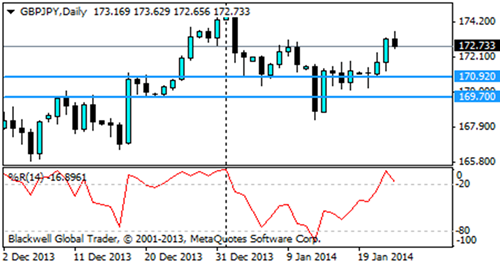 I have been a big fan of trading against the JPY since the autumn period. There are signs ahead for future JPY weakness, such as the inevitability for future QE, a deflation problem alongside a wider trade deficit occurring once a month. In contrast, the GBP is riding high, after posting a nine year best retail sales result, followed by a below expected unemployment rate. However, despite this pair accelerating nearly 400 pips within the past week, I have noticed that the fundamentals listed below may put a halt to this pair's recent progress and I am now looking for a small retracement. For example, despite the UK unemployment rate being within 0.1% of the Bank of England (BoE) threshold target, there are reports emerging that BoE policymakers are set to announce that there will be no imminent change in interest rates. The feeling within the BoE is that CPI is now within their 2% target, meaning there is no hurry to increase rates. Furthermore, economic releases from the UK are scarce up until Wednesday’s GDP release, therefore I expect buying pressure to settle down for the next few days. Likewise, despite the IMF confirming suspicions that the Bank of Japan (BoJ) is not going to hit their two year inflation targets, they are also suggesting that because Japan’s CPI is starting to show an increase, the BoJ will refrain from further easing for the next few months. It was expected that the BoJ would announce further easing during Wednesday’s monetary statement, however this was not the case. No signs of imminent QE from the BoJ will strengthen the JPY, devaluing this pair. When looking to trade this pair, I see a support level held at 170.920, followed by a minor support level at 169.700. There is a further support level at 167.680. However, I don’t foresee this pair retracing by nearly 500 pips. The Williams Percent Range is showing that this pair has now been heavily overbought, and this is encouraging me to expect a consolidation. Overall, although I have said in the past that I am a big fan of trading against the JPY and it is clear to see that this pair has accelerated in value greatly in the past couple of months, it is expected that the BoJ is not yet going to announce further QE anytime soon. This, alongside the prediction in which the BoE will state that there will be no impending increase in interest rates, is encouraging me to short this pair for the time being.